We decided to have lunch at the famous Sapporo Central Wholesale Market in Hokkaido. 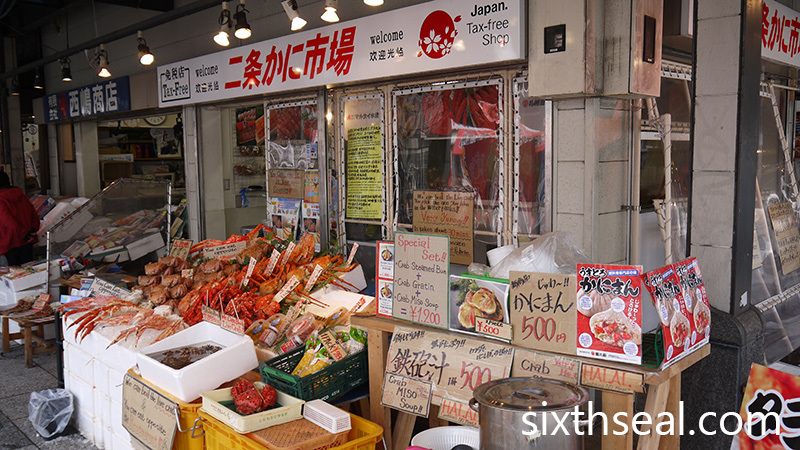 The market is known for fresh and local seafood and there are a lot of stalls which serve the crabs, seafood and fish they sell on top of rice (called kaisendon). 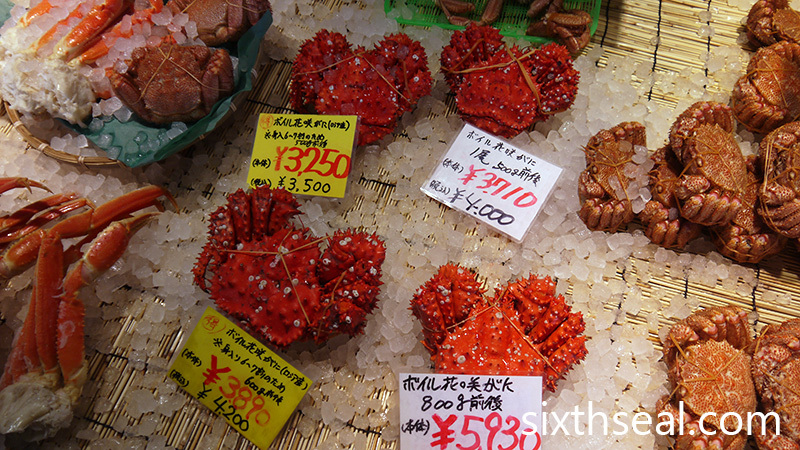 It’s less commercialized than the Nijo Market and the Curb Market beside the wholesale market is open to the public. 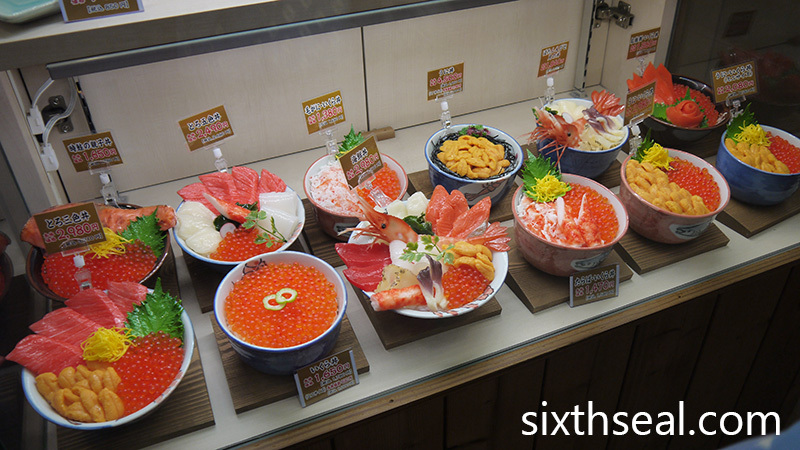 It’s the best place in Sapporo to eat sashimi on rice! 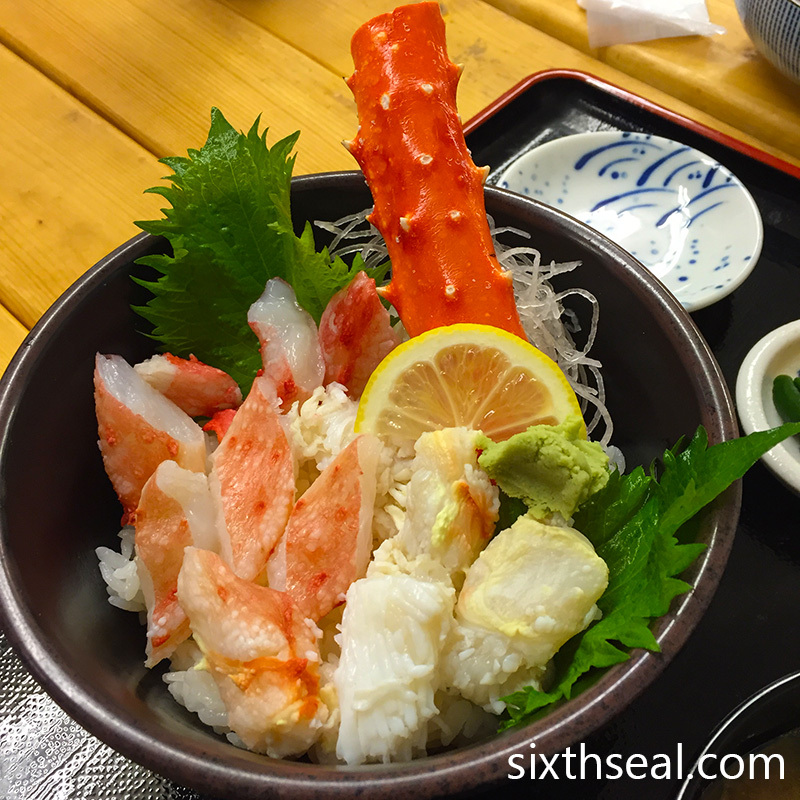 There are several huge restaurants at the Sapporo Curb Market and I was intrigued by the beautiful bowls of fresh seafood there. 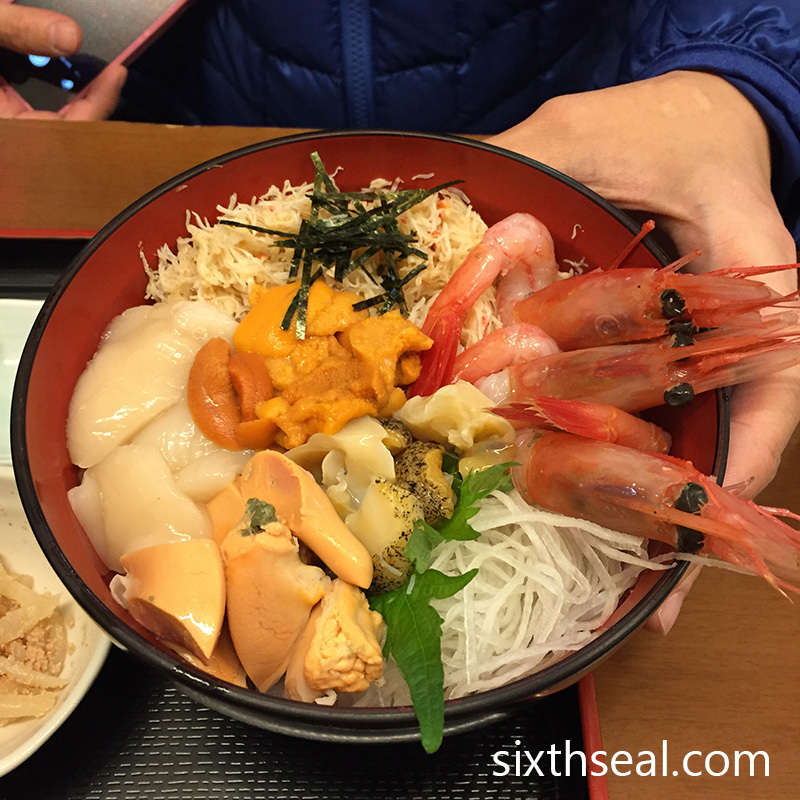 You can have a luxurious bowl of rice topped with fresh raw uni (sea urchin) for JPY 4,500 (about RM 180) or a bowl of rice with a bit of everything for JPY 2,980. 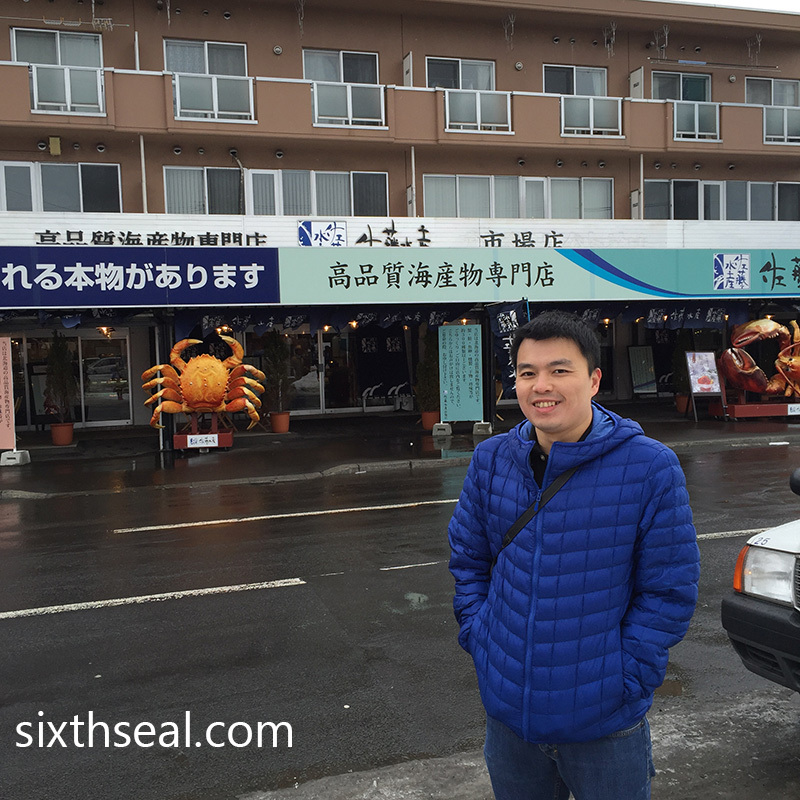 The prices might sound a little steep but these are super fresh premium local seafood. 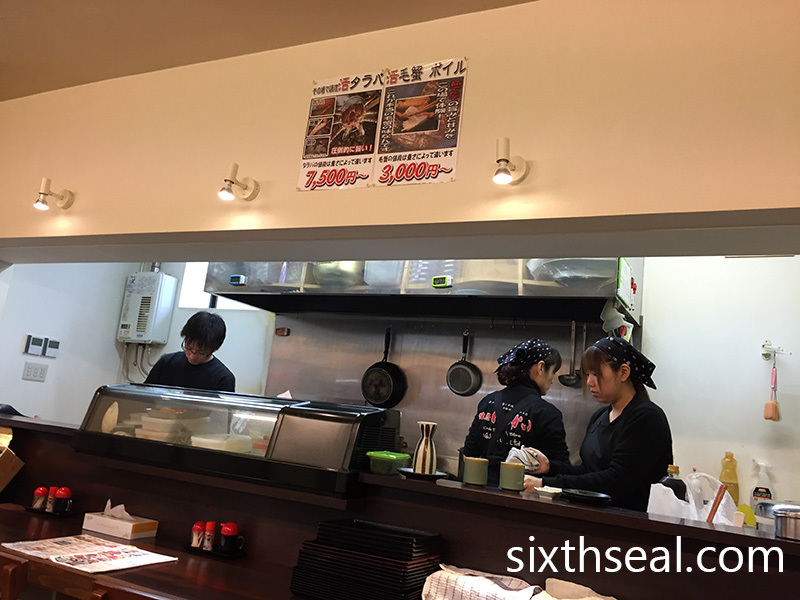 However, my better half wanted to go to a locally owned restaurant instead and thus we popped into a hole-in-the-wall where the locals went to. 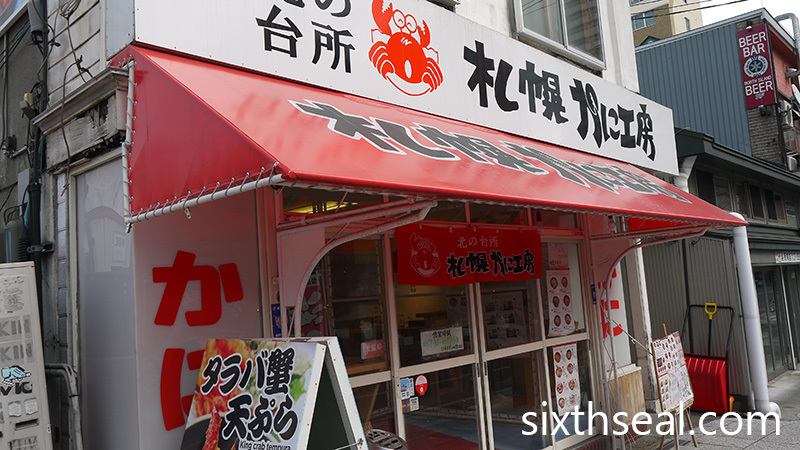 The stuff they all serve are pretty much the same – it’s basically variants of different types of seafood on rice, since this is a restaurant attached to a fish market. 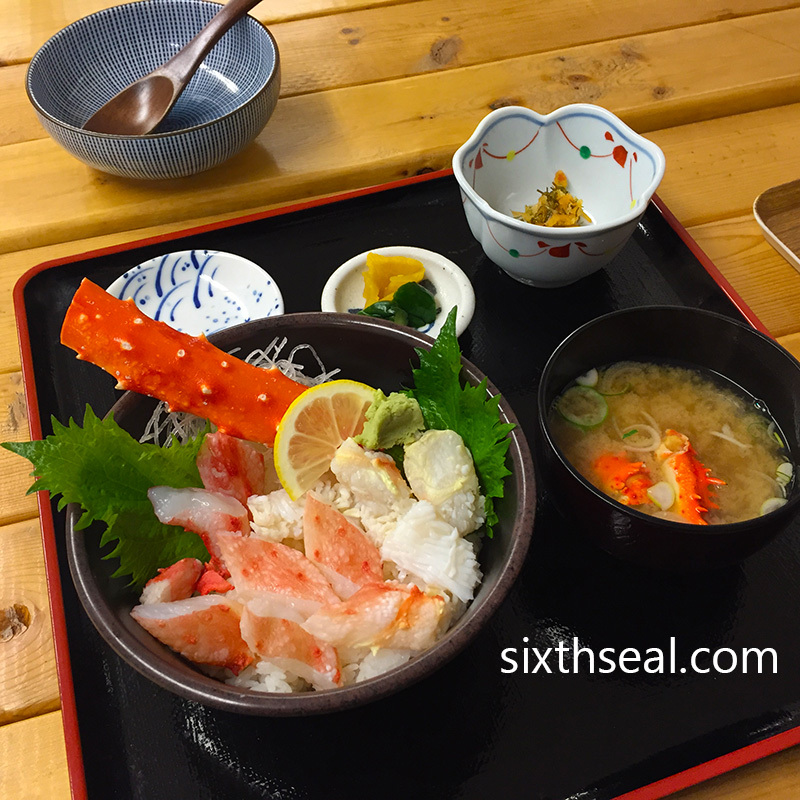 You can also upgrade your miso soup to crab miso soup for JPY 500 (about RM 20). I did that for mine and this is what it looks like. 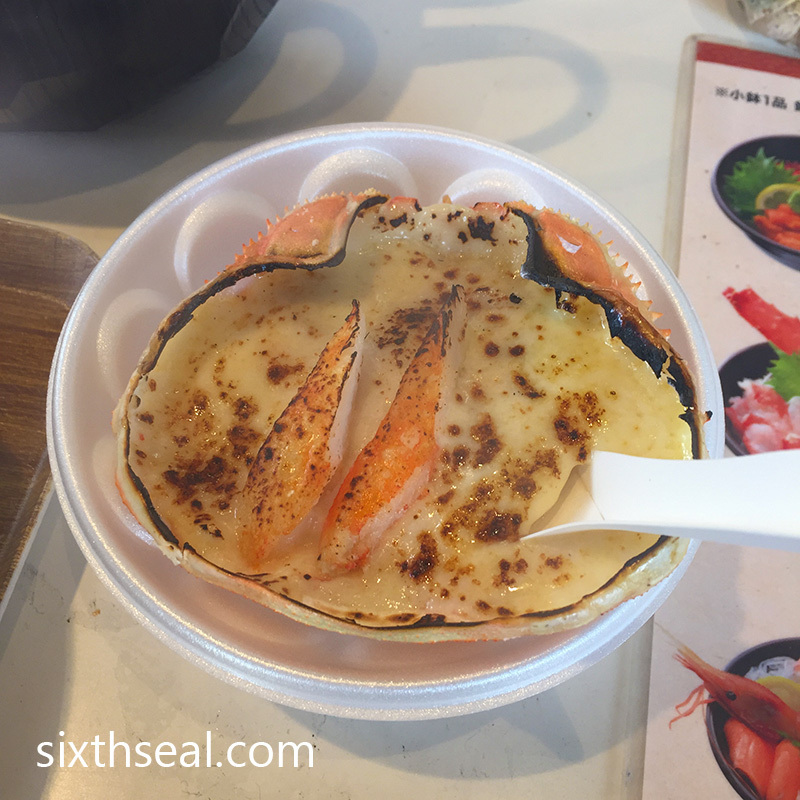 The restaurant put both snow crab and horsehair crab (also known as Hokkaido Hairy Crab) into the soup for a 500 yen supplement, which is a good price. It has one leg from a snow crab and one body from a horsehair crab. I ordered the seafood donburi. 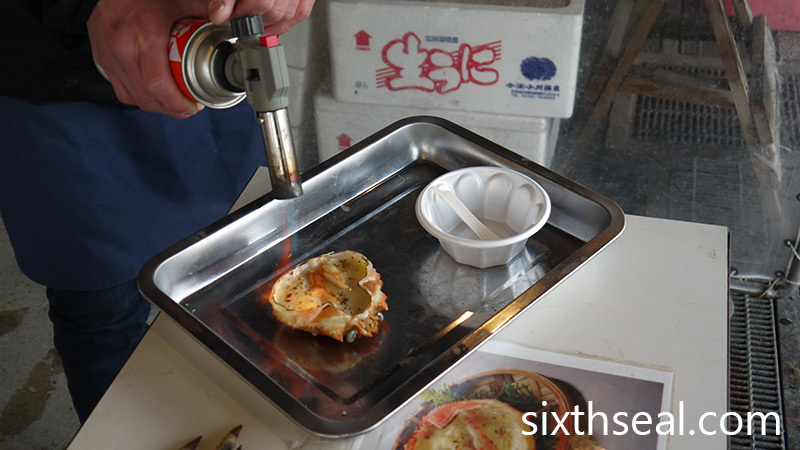 You can choose as many types of seafood as you want and it’s calculated accordingly. 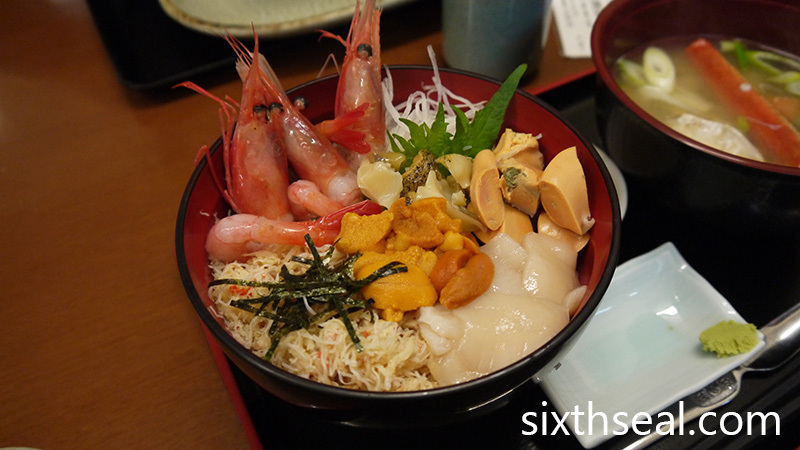 I went with 5 toppings + sea urchin for JPY 2,800 (about RM 110). 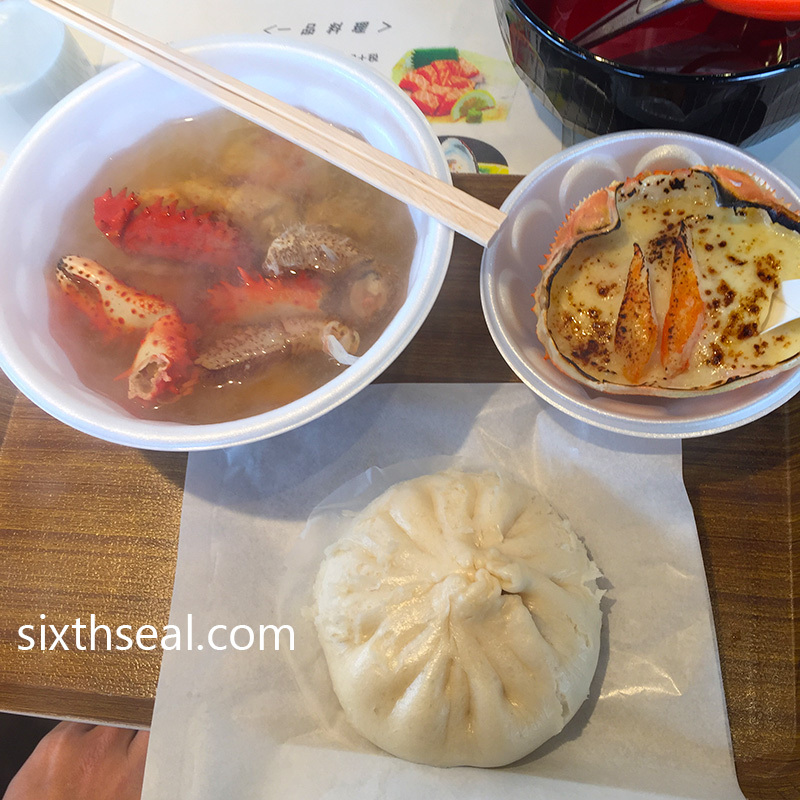 I chose horsehair crab (ケガニ/kegani), humpback shrimp (peony ebi), surf clam (hokkigai), squid (ika), scallop (hotate), and sea urchin (uni) in the middle. OMG! This is without a doubt the best donburi I ever had! 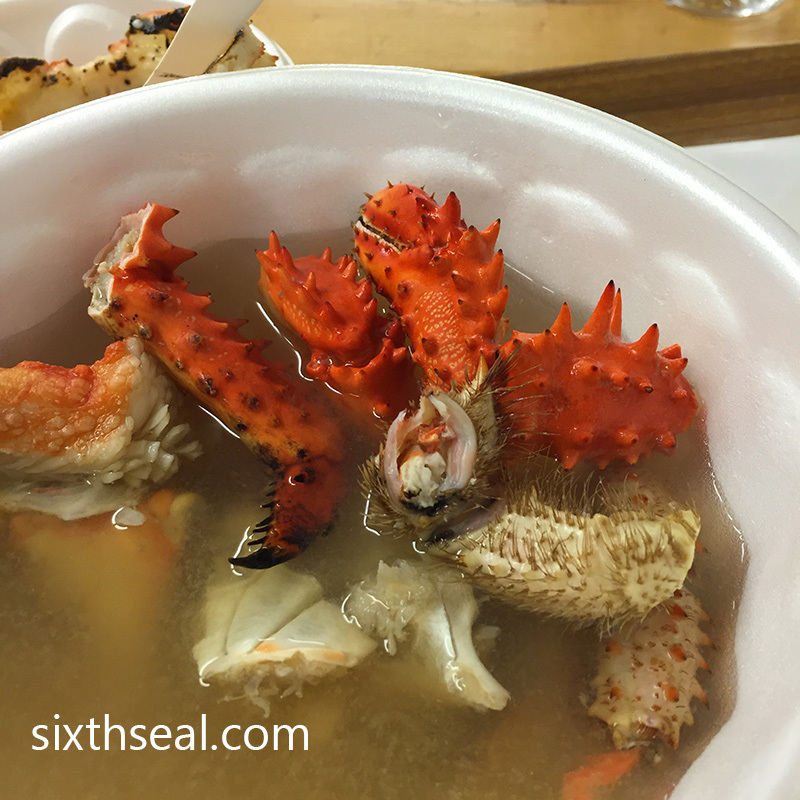 The horsehair crab (far right) is a local species and the only cooked item in this bowl. The humpback shrimp is raw and extremely sweet! 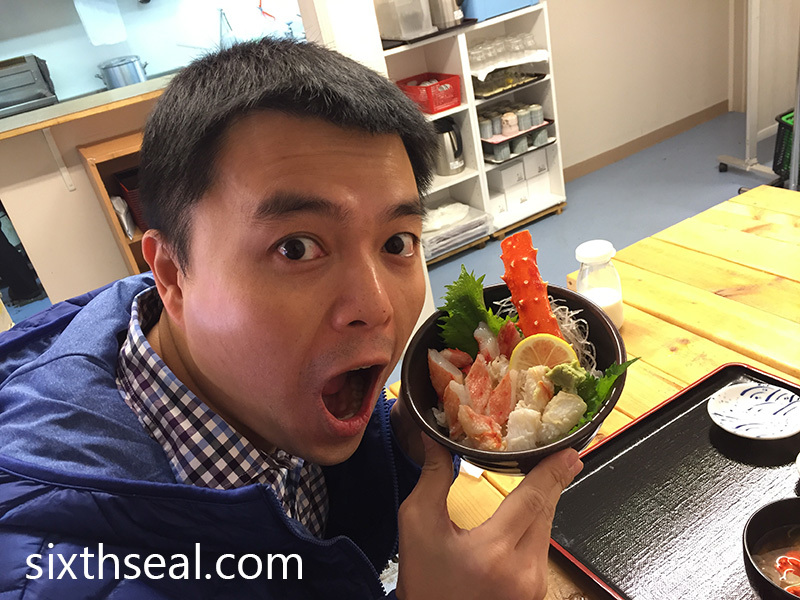 It’s called peony ebi in Japanese and it’s the largest shrimp in Hokkaido. 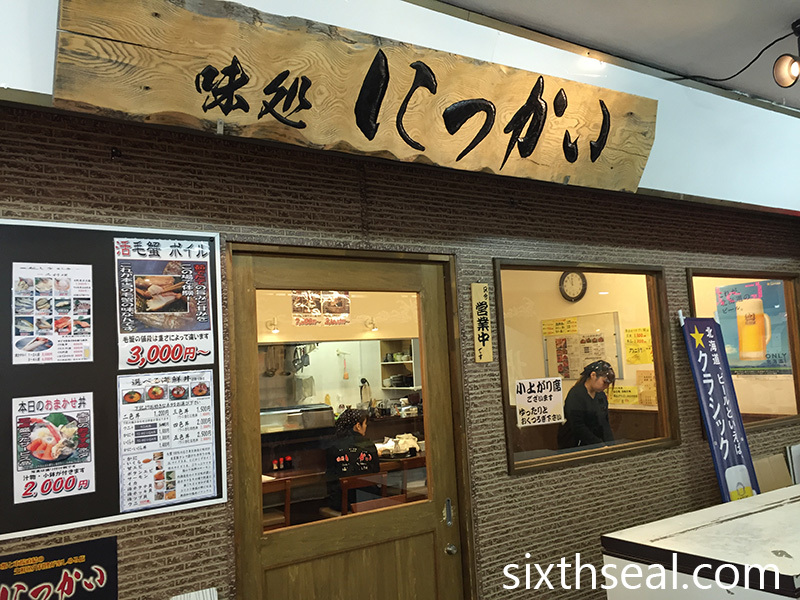 I loved the crunchy surf clam and the soft scallop too. 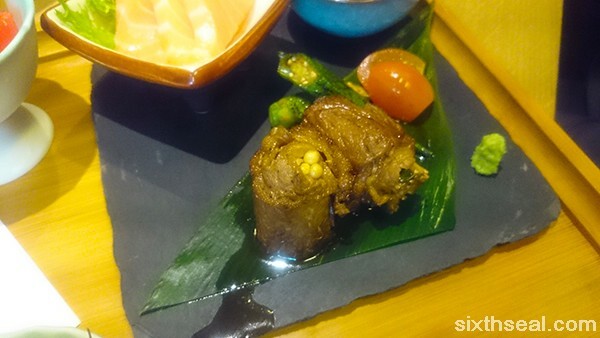 The squid was the most interesting thing – I was puzzled at first coz it didn’t look like any squid I’ve ever seen. This brown/orange stuff at 7 pm is actually part of the squid’s head! 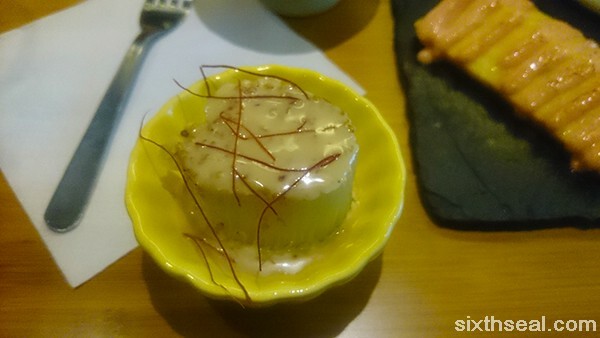 It’s superbly creamy (like foie gras from the sea) and has a wonderful mouth feel. Very sweet too. It’s hard to find squid like this unless you order ikizukuri (live sashimi) coz the squid head (brains?) is one of the most sought after items. I loved it! The uni was also perfect, freshest I’ve ever had. You have to eat the uni in Hokkaido, it’s a completely different species called ezo bafun uni (short-spined sea urchin). 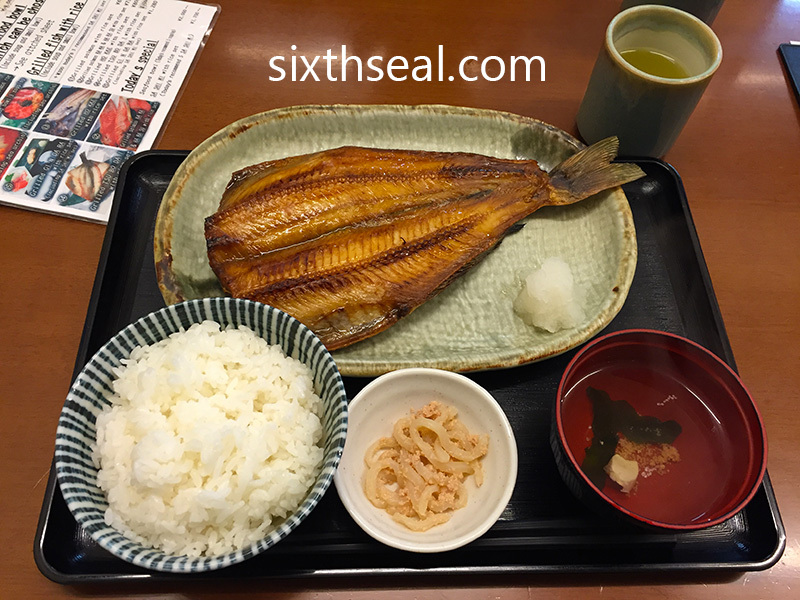 Hokke (ほっけ) is what the Japanese call Okhotsk atka mackerel – it’s caught off the waters of Hokkaido so it’s super fresh and local. My dear wanted something hot so she had this for JPY 850 (about RM 40). It’s grilled and served whole with rice. 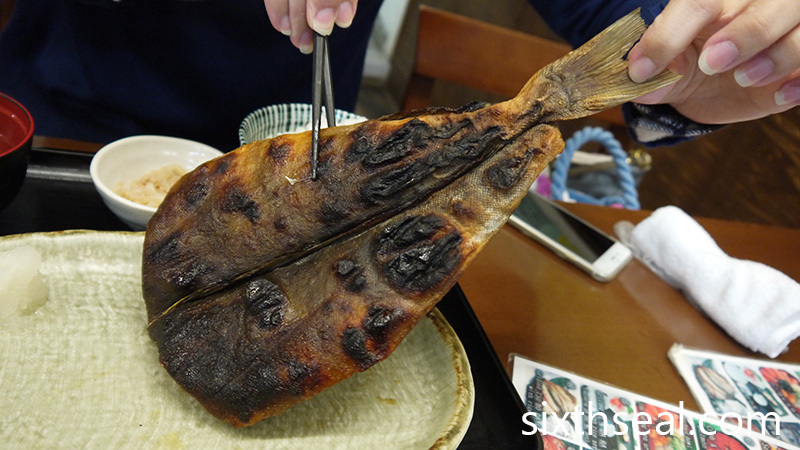 The hokke fish is charred on the skin since it’s cooked yakitori style – they call it yaki hokke (焼きホッケ) in Sapporo. You’re supposed to pick at the meat and the awesome thing is that there are no pinbones inside. You can also eat the skin but it’s slightly chewy and crispy. The caramelized flesh is really delicious though – the semi burnt smoky taste permeates the whole fish and it’s quite substantial in size. 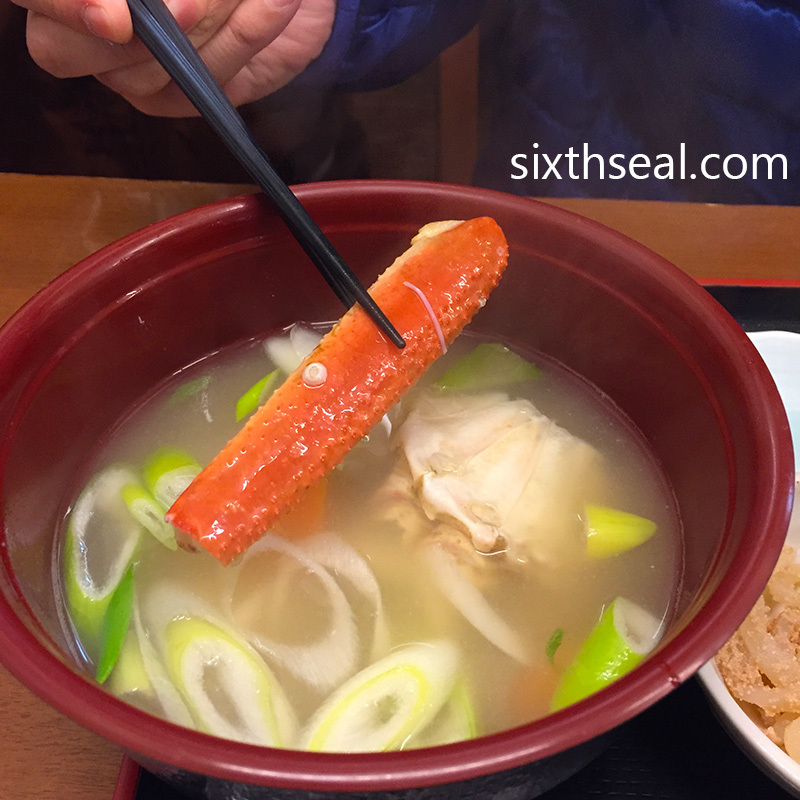 This is served with miso soup and a bowl of rice and there’s nothing quite like eating such a locally caught fish inside a warm family owned restaurant attached to a fish market in the cold, snowy winter. I have been to IPPUDO a couple of times in the past and found their Hakata tonkotsu pork bone soup to be better than most. 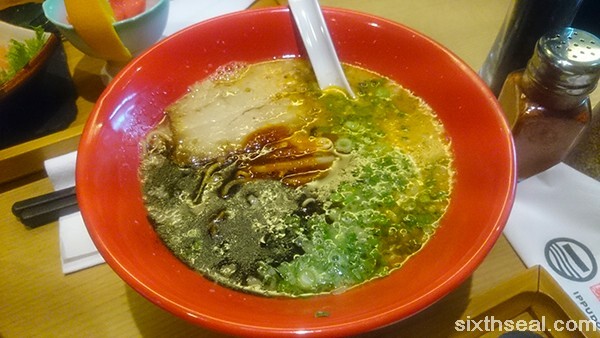 IPPUDO is famous for their Kyushu style ramen and pork buns. The latter is actually really yummy! 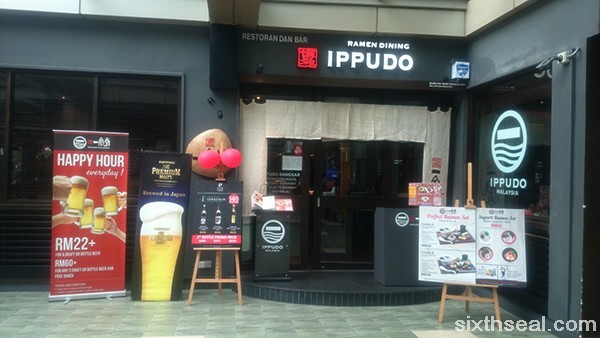 The one in Bangsar Shopping Centre (BSC) is actually a new Bar IPPUDO – one of their IPPUDO x sake outlets. 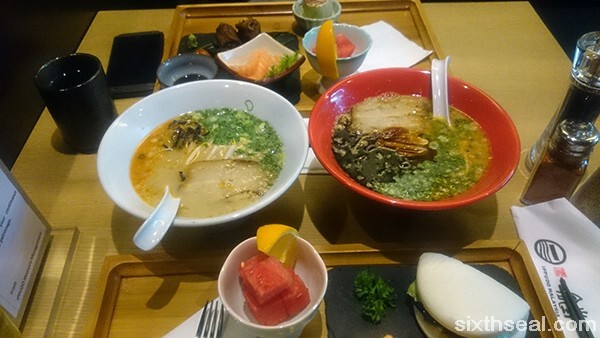 This doesn’t mean that Bar IPPUDO don’t still serve good ramen though. I was there for lunch with Ang Khian and the place was packed! I originally wanted to meet at MidValley but due to the school holidays, there was no parking to be found. I circled two parking lots (C and H) for almost an hour before giving up and going to BSC instead. There was a waiting list to get a table and I finally managed to get seated. I was tempted to order the Samurai Rock (around RM 40) cocktail which is made with Nikka From The Barrel but since it was a lunch meeting, I abstained and just stuck to their lunch sets. I made this choice for the Ippudo pork bun, which sounds mundane but is surprisingly good. 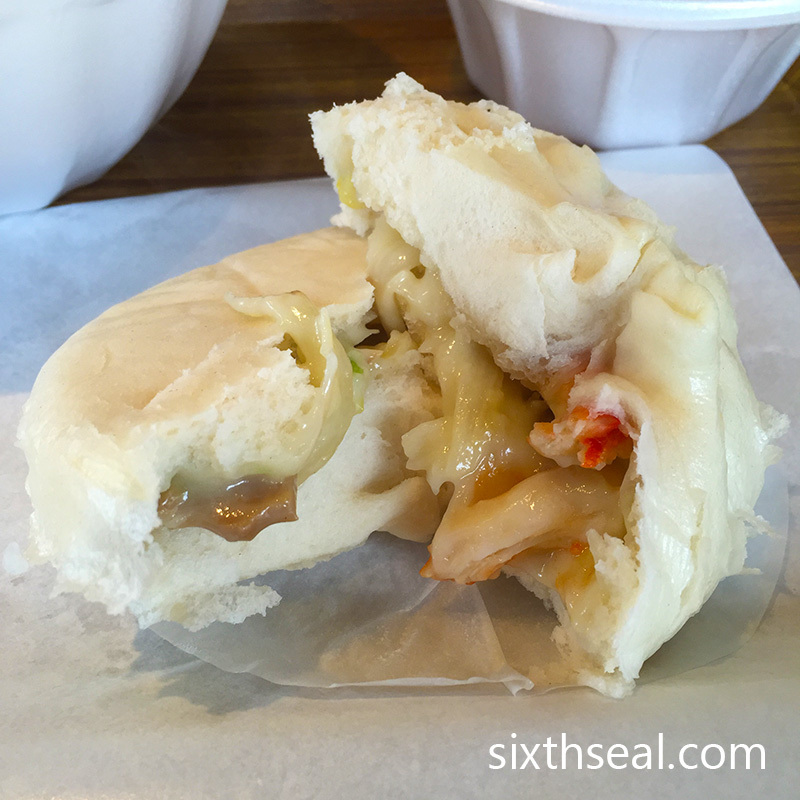 My first bite left me wanting more – the pork belly in the soft and warm enveloping clamshell dough was simply divine! I really liked the sweet tamagoyaki too but the nappa cabbage was left half-eaten. The dessert of watermelon with a wedge of orange was pure genius though – the orange slice was cut in a way that each cube of watermelon *absorbed* the orange juice and it tasted wonderful. 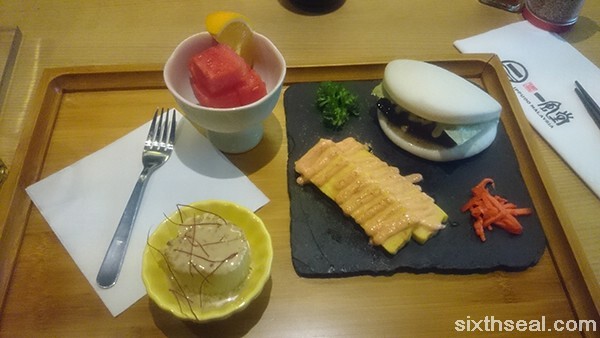 This set had two different items – sashimi replaced the pork bun and beef enoki the tamagoyaki but it’s otherwise the same. 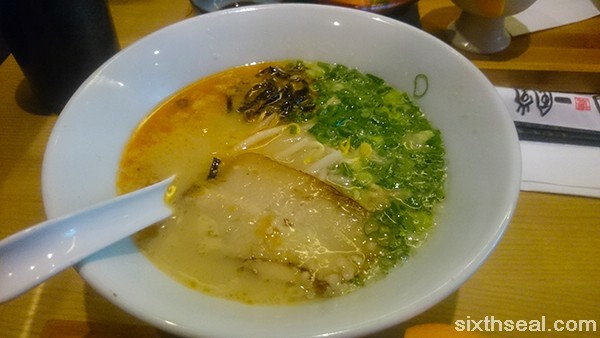 You also get the same ramen options and Ang Khian went for the Akamaru Shinaji half bowl ramen. 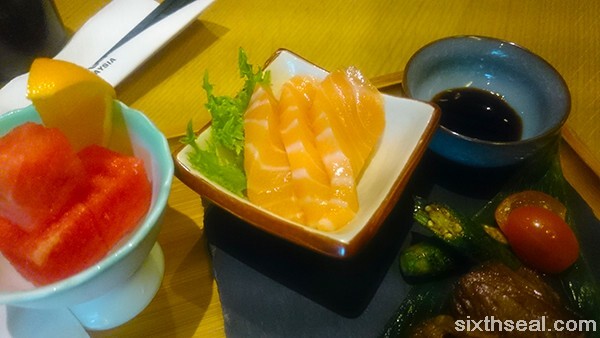 She asked me if I wanted to have a slice of her salmon sashimi and I said it’s fine. I was just being polite coz it’s only the second time I met her and we were discussing some business over lunch. Haha. I really wanted to eat it but I haven’t seen her since Chinese New Year in Ipoh in 2009 so I decided to be gracious. I was quite tempted to eat her beef enoki too. 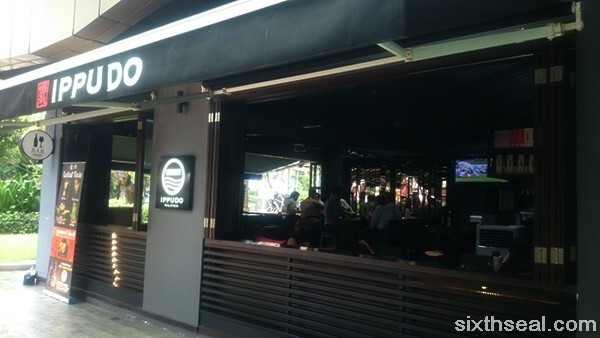 The service was really rushed and you can see the waitresses visibly harried – the lunch crowd at Bar IPPUDO, BSC is surprising considering the amount of F&B outlets there. People came, they ate, and they left – the turnover was so fast that we couldn’t talk shop and finished our lunch before heading over to CBTL for coffee (forgot there was a Dome there). 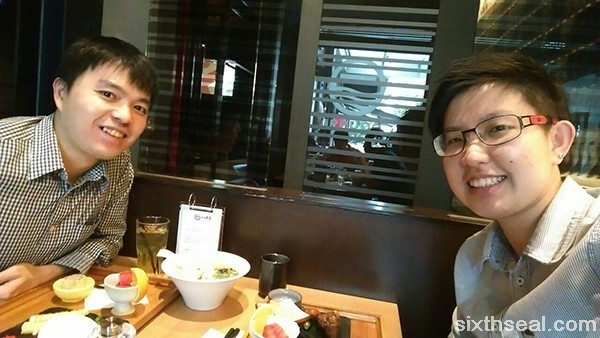 My cousin is here on a business trip and I had dinner with him to catch up. I actually just met him in Singapore a couple of weeks back, but that was just to pass him some stuff from my sister’s condo. It was about to rain so we didn’t have much time to talk. L-R: Mr. Poh, Mr. Poh. My dad is the oldest son of my grandfather and I’m his youngest son. My cousin’s dad is the youngest son of my granddad and he’s the oldest son. Guess how far apart our ages are? It’s surprisingly not far apart. He’s only older than me by *one year*. I’m kidding. He’s 24 and I’m 31. That makes it a 7 year difference. My grandfather also beget 7 offspring, which is totally coincidental and has nothing to do with this at all. 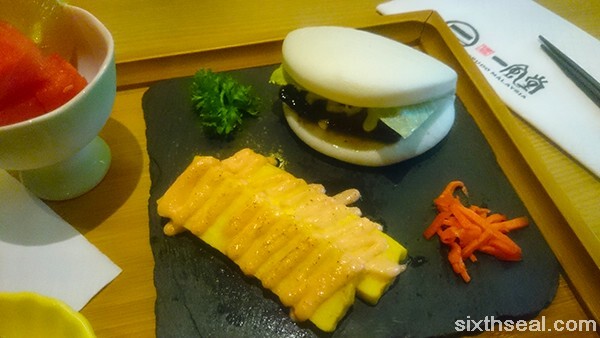 This is what I usually order when I have Japanese food nowadays. I’m a huge fan of unagi (eel) but due to my unhealthy diet I’ve taken to ordering this pretty consistently when I’m out. 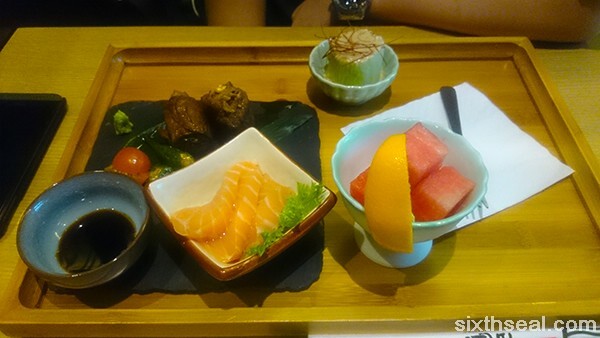 It’s assorted sashimi on sushi rice for RM 30. I actually like this version – best I’ve had so far. 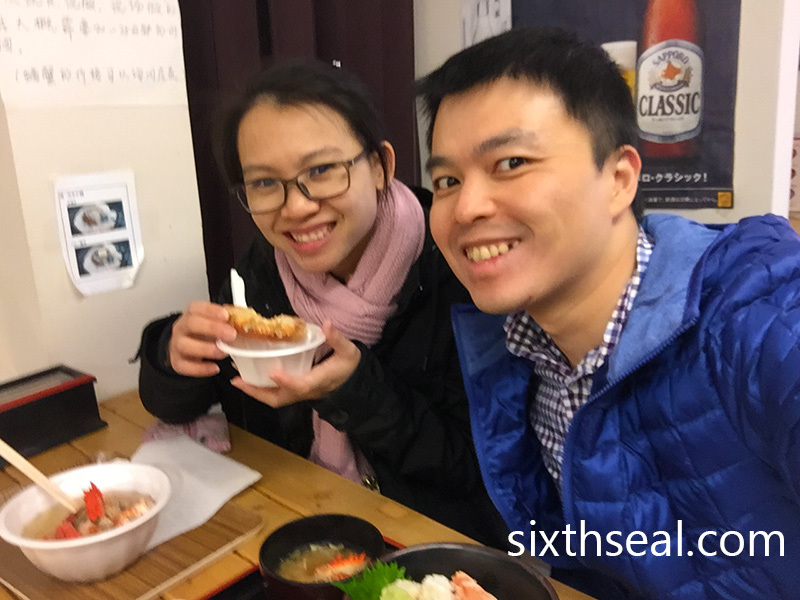 The selling point was the fatty raw salmon – it’s creamy and delicious! They don’t serve coffee (boo) but however this place has a 4sq special where you can get a green tea ice cream for free when you check-in. BTW, my cousin is single and available. Heh.